While the loonie may be being hit hard on currency markets, it will still be enough to pay for a lot of fun on Clifton Hill for Niagara Falls residents on Sunday. It’s that one day of the year when Niagara Falls residents can check out some of the museums and attractions on the city’s “Street of Fun” for just a buck. And it’s going to a worthy cause to boot. The Jan. 11 event is the annual Dollar Museum Day for Cystic Fibrosis, which takes place from 10 a.m to 5 p.m.
I’m sure there are many sites out there that have some video or other, but The Indignants has a 5-minute video on YouTube that certainly gives you a good idea of what it was like to be there. At a Monday afternoon news conference, the Niagara Parks Police announced the search for a 19-year-old woman who fell into the Niagara River and was swept over the falls Sunday is being scaled back. The story was among the most widely read items on CBCNews.ca Monday, and generated lots of audience feedback. Here’s a sampling of what you had to say. The accident prompted some Community members to suggest a few ways to enhance safety at Niagara Falls. Read the article to find out what some of the comments on the CBC web site said about the safety around Niagara Falls. 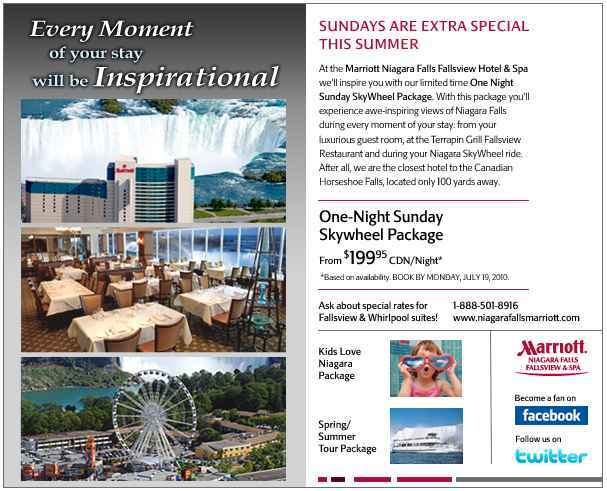 Last Wednesday I received the latest email newsletter from the Marriott Niagara Falls Fallsview & Spa. You can subscribe to the newsletter by clicking on the Special Email Offers link on the side of the Marriott Niagara Falls Fallsview & Spa main page.